The Alegria are favourably priced and capable of producing a surprising range of drum and percussion-like sounds. Good build quality. Will work well with recording/live PA systems. There will be many guitarists (especially those into Classical and Flamenco styles), who are familiar with the range of beautiful guitars from Manuel Rodriguez. Now in the third generation, this family-owned business has been hand-crafting guitars in Toledo near Madrid since 1905. Its reputation is richly deserved, with superb build quality and sound produced from the classically proportioned European acoustic guitars - Eric Clapton, Paco de Lucia, Andre Segovia and Sting are amongst its list of high-profile clients. Manuel Rodriguez and Sons adheres to a strict eco ethos, with all the power for the factory machinery and lighting provided by solar panels covering their factory roofs. Not a scrap of material goes to waste with all its heating, courtesy of shavings, sawdust and other small pieces - burnt in special eco boilers. Many of the larger off-cuts from guitar production become component parts for its cajons - parts such as the extensive internal bracing, snare adjusters etc. This cajon is standard sized and with a rectangular box construction. "Inside is a label of authenticity - similar to those found when peering in through the sound hole of any Manuel Rodriguez guitar"
Pictured top, the Alegria (a Flamenco rhythm term meaning joy and happiness), is also a name commonly given to senoritas and one of the most affordable in the range. With a shell made entirely from 10mm thick Medium-Density Fibreboard (better known as MDF), it's finished in a matte black with a light, natural finish tapa, made from plies of birch. There's a sound hole to the rear, Phillips screw fixings for the tapa, small rubber feet found on the base, snare-effect wires and a large guitar graphic on the tapa.. Inside is a label of authenticity - similar to those found when peering in through the sound hole of any Manuel Rodriguez guitar. The printed label has 'Manuel Rodriguez e Hijos' together with handwritten model designation, serial number and date of manufacture - awarding the cajon with an extra touch of class and credence. Unfortunately, resonance isn't quite the Alegria's strongest point - in fact it does seem a bit dull. This may not bode well in a dry acoustic environment (lacking in the projection department perhaps), but, when put through a PA set-up or when used for recording, this shouldn't present a problem. 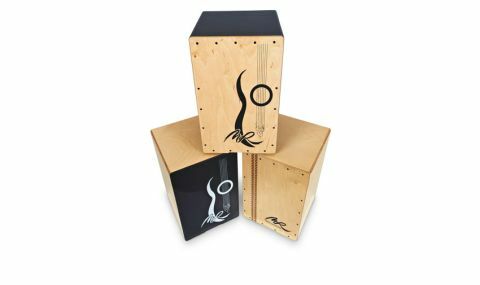 Though this cajon originates from a country steeped in the tradition and passion of the Flamenco, creating rhythms from almost any part of the world is feasible. The sounds produced though are quite snappy - just like the Flamenco - where the cajon responds well from some delicate finger taps to some nicely aimed wallops - sometimes like striking the body of a guitar.